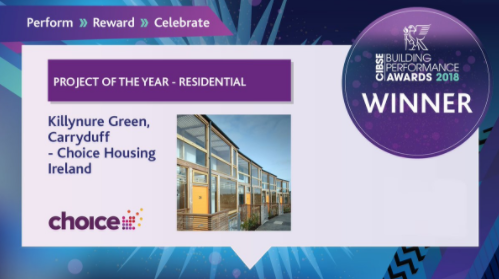 Congratulations to Choice Housing for winning the CIBSE 2018 Project of the Year – Residential Award, for the pioneering Killynure Green social housing development. It is the latest award for the Code for the Sustainable Homes Level 5 housing scheme in Carryduff, south east Belfast. PDP London was the competition winning architect team and Eight Associates was the Code Assessor for the 39 home development. The houses are situated in clusters around landscaping making the most of the natural topography to give a range of private, semi-private and public spaces, including junior play spaces and a flower meadow. The homes are arranged to utilise positive solar gain in winter, and are constructed from a pre-fabricated structural timber system to achieve high levels of air-tightness and insulation. The roofs are oriented at 29 degrees south to achieve the maximum orientation for photovoltaic panels. We’re delighted to have worked on this exemplar project which achieved an ambitious sustainability brief.